The exhaust gas control system is provided to improve warm-up and heater performance. This system actuates the exhaust gas control valve VSV, which is attached to the exhaust manifold. It increases the exhaust pressure to increase the exhaust temperature and engine load, in order to improve warm-up and heater performance. The exhaust gas control system operates when the warm-up switch is ON, and all the conditions listed below have been met. – The EGR is operating. – The coolant temperature is below 70°C. – The ambient temperature is below 5°C. – A minimum of 10 seconds have elapsed after starting the engine. 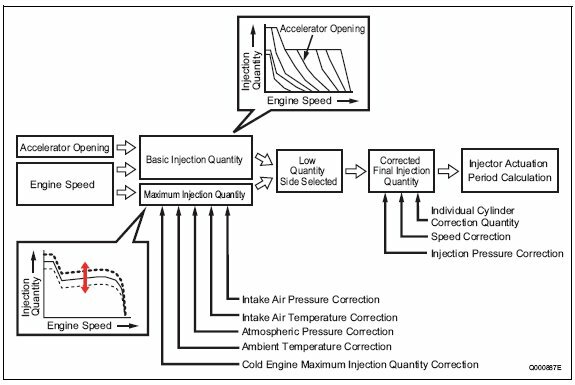 – The engine speed and fuel injection quantity are in the state shown in the graph below. The electronically controlled throttle is located upstream of the EGR valve in the intake manifold. It controls the throttle valve at an optimal angle to regulate the EGR gas and reduce noise and harmful exhaust gases. • Signals from the engine ECU actuate the stepping motor, which regulates the throttle valve opening. • To further increase the EGR volume when the EGR valve is fully open, the vacuum in the intake manifold can be increased by reducing the throttle valve opening, which restricts the flow of the intake air. • When the engine is being started, the throttle valve opens fully to reduce the emissions of white and black smoke. 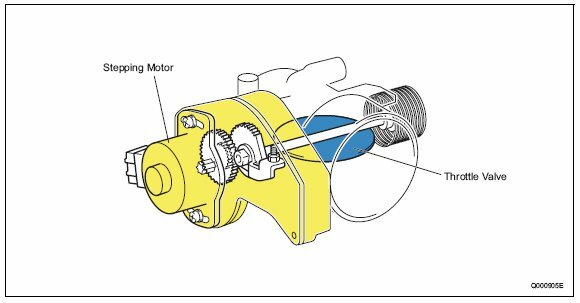 • When the engine is being stopped, the throttle valve closes fully to reduce vibration and noise. • During normal driving, the throttle valve opening is controlled in accordance with the engine conditions, coolant temperature, and atmospheric pressure. 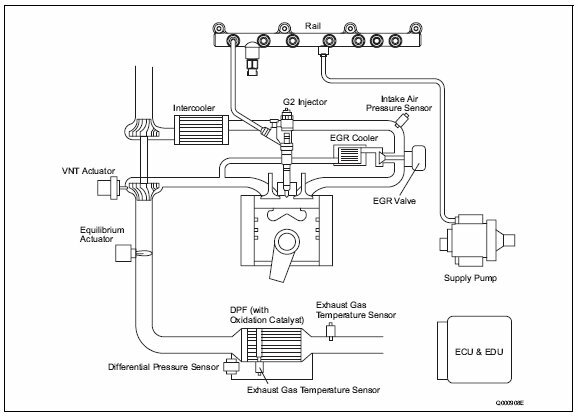 downward, which determines the opening of the EGR valve and controls the EGR volume. 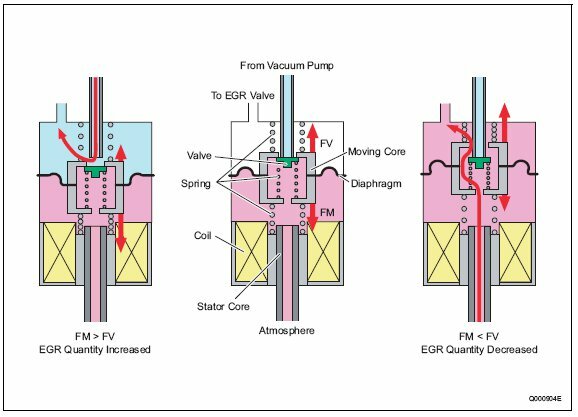 EGR in order to increase the EGR volume. 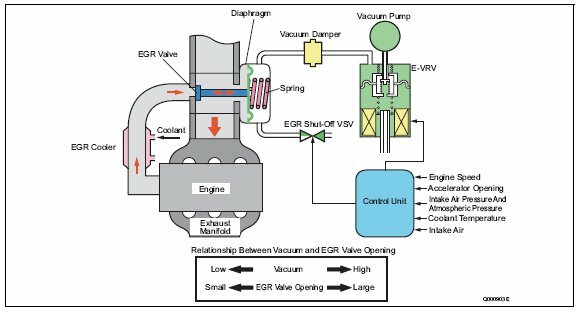 vacuum increases, which causes the EGR valve to open and the EGR volume to increase. Meanwhile, because “increased output vacuum equals increased FV”, the moving core moves upward with the increase in FV. When FM and FV are equal, the port closes and the forces stabilize. 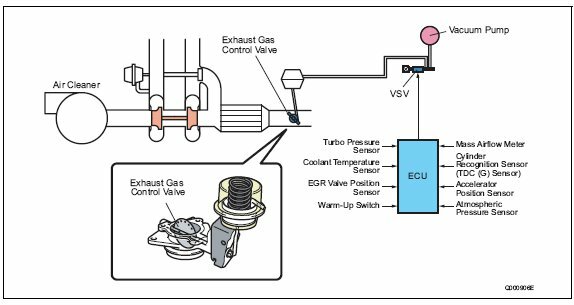 Because the vacuum circuit of the EGR is a closed loop, it maintains the vacuum in a stabilized state, provided there are no changes in the amperage. causing the valve that seals the upper and lower diaphragm chambers to open. Consequently, the atmospheric pressure in the lower chamber enters the upper chamber, thus reducing the output vacuum. This causes the EGR valve to close and the EGR volume to decrease. Because “decreased output vacuum equals decreased FV”, the moving core moves downward with the decrease in FV. When FM and FV are equal, the port closes and the forces stabilize. 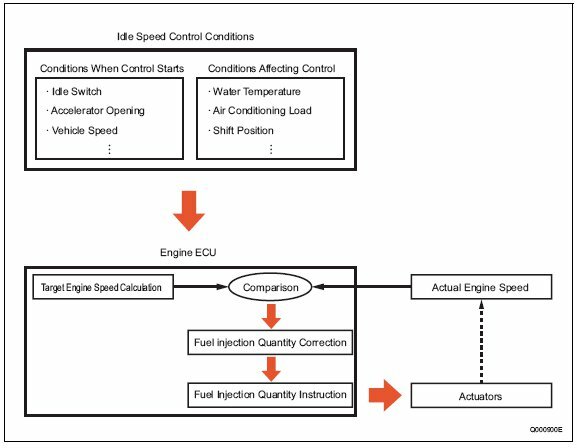 • The idle speed control system controls the idle speed by regulating the injection quantity in order to match the actual speed to the target speed calculated by the computer. The ISC can be automatic ISC or manual ISC. – With automatic ISC, the engine ECU sets the target speed. The target engine speed varies with the type of transmission (automatic or manual), whether the air conditioner is ON or OFF, the shift position, and the coolant temperature. – The idle engine speed is controlled by the setting on the idle setting button at the driver’s seat. speeds (times) of the cylinders and regulates injection quantity for each individual cylinder in the event of a large difference. The engine ECU calculates the fuel injection pressure, which is determined by the final injection quantity and the engine speed. The calculation is based on the coolant temperature and engine speed during start-up. 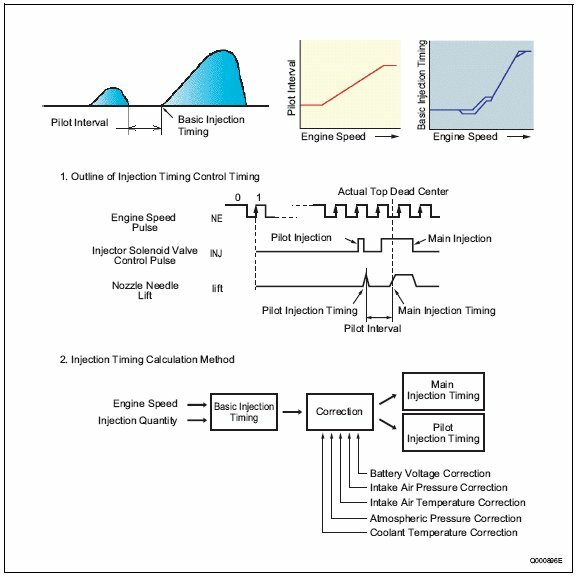 Although the injection rate increases with the adoption of high-pressure fuel injection, the ignition lag, which is the delay from the start of injection to the beginning of combustion, cannot be shortened to less than a certain period of time. 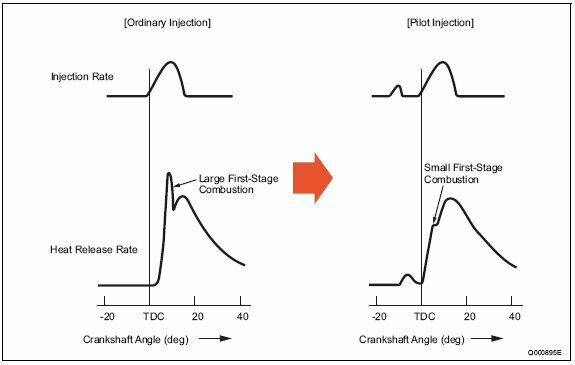 Therefore, the quantity of fuel injected until ignition takes place increases (the initial injection rate is too high), resulting in explosive combustion simultaneous with ignition, and an increase in NOx and sound. To counteract this situation, pilot injection is provided to keep the initial injection at the minimum requirement rate, to dampen the primary explosive combustion, and to reduce NOx and noise.